The City Roanoke uses many parking signs to provide information about when, how long, and for what purposes a vehicle may park on-street or to designate specific curb uses as well as parking zones. Sometimes two or more signs are combined when several regulations apply to the same curb space and parking zone. Signs are meant to be read from Top to Bottom. Also, they are color coded much like traffic lights. Red means there is a prohibition, limitation or No Parking while Green indicates Parking is allowed. Signs have arrows on a flat surface and only direct parking for the side of the street that the sign and sign pole are located. A double arrow means that parking is allowed on both sides of the sign. A parking sign regulates all parking spaces within the zone in the direction of the arrow(s) until the next parking sign or the end of the block. Pay close attention to any Exceptions. Is the Green arrow pointing towards your car? If yes, you may park there within the days, times, and exceptions or limits. Is the Red arrow pointing towards your car? If yes, then you may not park there. 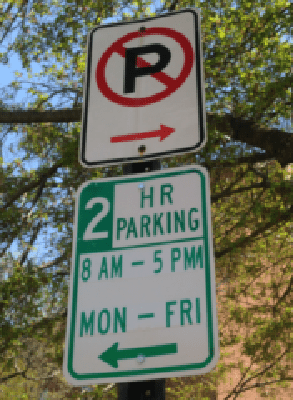 Here is a downloadable Guide to Parking Signs that explains ways to read and interpret signs used in the City of Roanoke along with information about on-street Parking Regulations. Please contact PARK Roanoke at (540) 343-0585 or email us at parking@PARKRoanoke.com.